Rhodia notebooks are the french orange notebook with a cult following. I believe it is simply impossible to have a passion (or even an interest) in notebooks and not to have come across the Rhodia Notebook brand. The orange cover dates back to 1934. The stationer known as “Papeteries Verilhac Freres” was founded in Lyon, France in 1932 by two brothers, Henri and Robert Verilhac. They came from a family of paper merchants, with two brothers from the previous generation having set up a family business selling paper mainly in the southern part of France and North Africa. In 1934, the company moved from Lyon to Sechilienne near Grenoble in the French Alps. The name “Rhodia” comes from the Rhone, a river flowing by Lyon dividing the Alps from the Massif Central. Production of their notepad began that year. Rhodia was purchased by Clairefontaine in 1997 and production transferred to Mulhouse, in Alsace, France. Members of the Verilhac family still work for Rhodia. The Rhodia logo dates back to 1932. Legend has it that the two Rhodia fir trees symbolize the two founding brothers. People love Rhodia pads and notebooks for their grids, smooth paper & iconic cover. What is even more exciting about the Rhodia Brand is the online following, the social media presence and the great Blog: Rhodia Drive. If you are based in the UK you can find all you rhodia needs at Bureau Direct. That’s news to me. 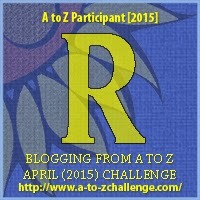 But then again, that’s what A to Z is all about! Never heard of them…. and I am definitely a notebook-ophile! I love smooth paper, but like designs, and also divisions in the book so I can write different poems or types of poems or projects in each section. I will look out for them though! I did go and see the websites – the links from your page opens in this tab, which means you have to backtrack a lot to get back to your page – when I put a link in on WordPress I always choose ‘open in a new tab’ which means the reader can get back easily, and your page isn’t lost! Visiting you in these closing days of the #Challenge. Glad to find this post on various notebooks. I’m always looking for the perfect one because I am a writer and keep notes going. Thanks for the hard work this takes to create these posts. If you have time or energy at this point in April, come and see what I’ve been up to. Love finding good blogs like yours. Thanks.